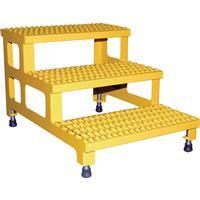 Our Step-Mate Stands can be used as either a comfortable worker platform or a semi-permanent step. Individual step sizee is 12" deep. Top step is fixed 7" higher than bottom step.The first step is adjustable 6" to 7 1/2", second step 13" to 14 1/2", and the third step 20" to 21 1/2". 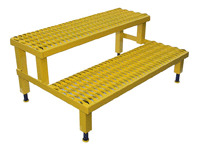 Serrated steel surface ensures safe footing. Legs adjust (Pic. 2) individually by screwing them into or out of the leg base. Welded Construction. Uniform capacity 500 lbs. Aluminum and Stainless Steel Construction - See Models and Pricing below. 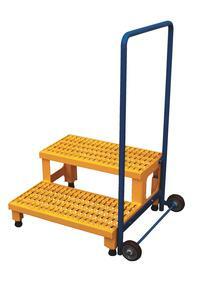 Model V-ASP-PORT-HT - Oprional Portability dolley kit allows movement of multiple step units. 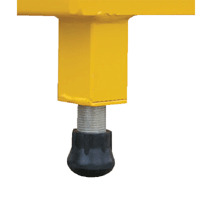 Dolly features special brackets for use with step stands. Includes pheumatic wheels for portability.